In the wake of D.C. Mayor Adrian Fenty’s loss to Vincent Gray last night, many of Washington’s political and media elite turned out for the red-carpet premiere of Waiting for Superman, a much-hyped documentary about education reform in America. It was interesting timing, to say the least: One of the film’s big stars is Michelle Rhee. The movie depicts her as a savior of schools and someone willing to make tough decisions others have bypassed. 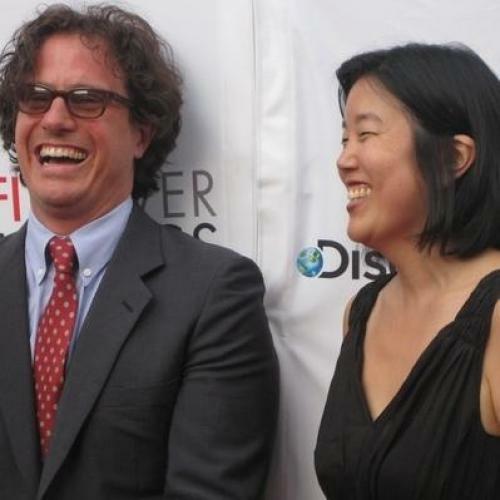 But, as I wrote earlier today, it’s not clear whether Rhee will have her job as chancellor of D.C. Public Schools for much longer—in large part thanks to her take-no-prisoners leadership style that the movie praises. I know better than to speculate in city politics. … I can tell you this: I spent a lot of in these schools in D.C.m and I met principals, and I met teachers, and I met kids. And this city needs reform. The stakes are really high, and they need someone like Michelle Rhee to reform these schools and to continue with the progress. [In] Washington, even though the mayor changes, the kids stay here. D.C. can’t go backward. I think all of the frenzy over this [movie] is showing that people are paying attention and the stakes are really high. Over a million kids are dropping out of schools every year … [and are] walking the streets in this modern economy. We are failing millions of kids. Make no mistake, when people are doing all this political speculation—that’s a game. Overwhelmingly, whether you agree with how it was done, the results can’t be disputed. I hope it’s inspirational to other leaders. And I think that some of the reforms that she put in place are the exact same reforms that are being put in place in Denver and other places. I don’t think it’s the end of an era. I think it’s the beginning of all of this massive change that we so desperately need. Maybe this is all wishful thinking. We’ll have to wait for Rhee and Vincent Gray to make their decisions, and for Waiting for Superman to open later this month, before we can really know. "Yesterday’s election results were devastating – devastating. Not for me, because I’ll be fine. And not even for Fenty, because he’ll be fine, too. It was devastating for the children of Washington, D.C.," Rhee said during the discussion. "The biggest tragedy that could come from [the] election results is if the lesson that people take from this is that we should pull back. … That is not the right lesson for this reform movement. We cannot retreat now. If anything, what the reform community needs to take out of yesterday’s election is: Now is the time to lean forward, be more aggressive, and be more adamant about what we’re doing." Also there last night was Randi Weingarten, head of the American Federation of Teachers and the villain of Waiting for Superman. Her union, as Ben Smith notes, shelled out about $1 million to unseat Fenty. Guggenheim, though, told me he believes Weingarten is becoming a better reformer. I guess he's forgiving the fact that she has called his film "inaccurate, inconsistent and incomplete."